This article originally appeared in the August 7, 2008 issue of the Wareham Courier. This post contains additional photos and video. 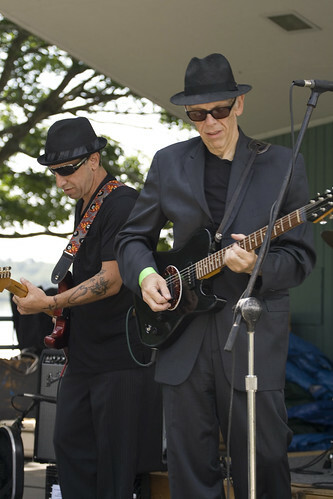 ONSET - The 16th annual Onset Blues festival set out swinging late Saturday morning. With artists like the Racky Thomas Band and Lynwood Slim on stage trading notes back and forth, it was easy to stay cool in the heat. Correia opened the show. A Wareham resident, the blues man has been supporting he show with his efforts for many years. Onset Blues Festival 2008 from Wareham Courier on Vimeo. With the help of Ricky “King” Russell’s band, Correia set a smooth tone for the rest of the afternoon. 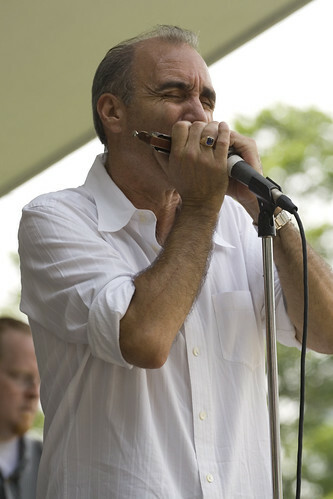 Russell is a fixture of the New England Blues scene who has helped along a generation of budding artists including band members Bob Worthington and 15-year-old drummer Danny Banks. Banks has made quite an impact in his short career, including an appearance on The Late Show with David Letterman. As they kept playing, the bleachers and grass slowly started to fill as the morning moved on. “Sixteen years they’ve been doing this, and it just gets better every year,” emcee Bill Narkiewicz, host of the Blues at 8 on WMVY, said. The hits just kept on coming, and as the coffee kicked in the audience got up and into the groove. It took a little bit of prodding, but by the time that Shirley Lewis and the Chris Stovall Brown band stormed the stage, people were ready to get up and dance. The beat kept up all afternoon, with only a few short breaks in the action while bands traded places on the stage. The lulls while bands tuned their instruments and played with the sound levels until they were a few hairs shy of perfect provided the audience with a great opportunity to get up and check out many of the vendors that lined the park, or to grab a hot dog and a coke. Anyone walking by could tap their toes to the sound of the music, but to experience the energy and enthusiasm you had to be sitting in front of that stage. Even as the crowd loosened up a few clouds started to appear on the horizon and a scattered few raindrops began to fall when Racky Thomas and his band came on. It didn’t really start to pour until the headliners, Roomful of Blues, came on to start their set. A few meeker souls had already left the grounds, and those that were left huddled under umbrellas and tarps. The band played through a few songs with good humor as the crowd started to thin out with each flash of lightning off in the distance. They kept playing even while roadies and volunteers started to take down the equipment and cover up the electronics that would have to get moved later. The rain may have won the day, but it was a wet and wild time at the band shell, and it will certainly leave people hungry for more next year.